There have been a number of publications in the Zimbabwe media, quoting comments from various ‘experts’, and citing developments elsewhere, using these to cast aspersions on the use of biometrics in the upcoming 2018 Zimbabwe elections. Examples of these publications are “Red Flag over Biometric Registration” (The Herald, 11 March 20017), “France’s Cancellation of e-voting: Eye-opener for Zim” (The Herald 9 March 2017), “BVR, A Luxury We Cannot Afford” (The Herald, 13 March 2017 – Editorial Comment) and most recently “More Thumbs Down for Biometric Voting” (The Herald, 15 March 2017). This effort has been systematic and sustained, culminating into a Newsday publication (16 March 2017) screaming “2018 Polls Hang in Balance”. All this comes after the tender process has commenced and a shortlist of companies compiled – maybe just a coincidence. This however is the political side of the process which the author will leave to political analysts. What these publications revealed was a clear lack of understanding of the Biometric Voter Registration process. This lack of understanding and “mis-information” is being used to discredit the process culminating in the set-up of an agenda giving cues to the abandonment of the biometrics project. This article is intended to correct some of this misinformation and misinterpretation of developments elsewhere. It also aims to clarify the proposed Biometric Voter Registration and Verification process (BVR) which Zimbabwe Electoral Commission (ZEC) is proposing, and has been successfully used in other countries. The common theme in these publications has been the misconception that ZEC is going to implement ‘biometric voting or electronic voting’. This then set the basis for the claim that the system would be susceptible to ‘cyber-attacks’ and ‘hacking’ which would derail the voting process and dis-enfranchise voters, citing France’s abandonment of electronic voting as an example. ZEC is not proposing to implement ‘biometric or electronic voting’; it is proposing a model of BVR which is very different from electronic voting (even though it can be used as a launch pad for electronic voting). Additionally, the process being proposed is not more vulnerable to cyber-attacks or hacking than any other electronic voter’s register or database. This will be further explained in this article. The call for the employment of technology in Zimbabwe for both voter registration and facilitation of the electoral process is not new. The issue has been raised in parliament several times. The intention to introduce biometrics in Zimbabwe for the 2018 elections has enhanced ZEC’s credibility, and should be applauded as a step in the right direction. Zimbabwe is not re-inventing the wheel, but is following in the footsteps of other countries including Ghana, Benin, Tanzania, Togo, Mauritania, Ivory Coast, DRC and Nigeria among others, which have successfully pioneered this technology. Before, dealing with the issues that are being raised in the recent publications, a brief explanation of biometrics is given here. Biometrics refers to human physical and behavioral characteristics such as fingerprints, the iris, signature, face etc. These can be used to uniquely identify an individual. This concept is definitely not new! Zimbabwe has been collecting people’s biometrics for decades; everyone has to have a picture taken and fingerprints captured to obtain a national identity (ID) or passport. This background and reference is important because BVR is just similar to this process. In BVR, a voter’s details (name date of birth, address etc) are digitally captured and stored alongside their biometric features (face and fingerprints) on a computer– that’s it. Nothing more nothing less! The advantage of this system is that these biometric features can be used to uniquely identify an individual in a computerized way and additionally, there is inbuilt software to identify and eliminate duplicate voters/registrants; leading to a clean voters roll. The deployment of personnel for the purpose of collecting BVR information is not different to that done in order to register people in the “old way”. Personnel will be trained and equipped with mobile voter registration kits. These are portable devices designed to create electoral rolls; equipment that is reusable, extensible and resistant to adverse conditions. These devices are self-contained, autonomous units supported by long-life batteries and can be used in remote areas for registration, even within homesteads. In the end, what is compiled is a normal database or electoral register which includes biometrics information. The second part of the process is voter verification or authentication which happens on voting day. This is whereby a person appears on voting day, presents an ID or provides a name. The person’s biometrics face and/or fingerprints are then captured and compared to those in the computer database (biometric voters’ register). Again mobile biometric kits/stations are available to achieve this, enabling penetration of remote areas. If there is a match, the person is verified, gets a ballot paper and continues to vote (manually) in the normal way! The person’s details are then digitally marked as having voted and cannot be used for repeat voting (no need for ink). This is NOT electronic or biometric voting, but manual voting as we are used to! The other dominant theme of the publications attacking the BVR process was the ‘susceptibility to hacking and cyber-attacks’. A biometric voter register, as mentioned before, is no different from any electoral register (as prescribed by the Electoral Act) or any other database. Therefore it’s susceptibility to hacking and cyber-attacks should just be at the same level; but this is not even the case as these biometric databases are more robust and designed to protect the sensitive personal information they contain. The issue of data privacy features dominantly in the development of biometric processes. Consequently, the BVR process has inbuilt protection included in the software packages (for example, template protection) which makes it more robust than the current electronic register which has been used in the previous elections. It is difficult to hack, and even if the data is somehow stolen it would be in an unusable format for the perpetrator. It is accepted that the outcry might have been based on the misconception that “electronic voting” and automatic tallying of votes would be carried out; an assumption which is very wrong. Another debate and negative concept being cast about the BVR process is its perceived cost, but before delving into the intricacies of financial cost, it is important to look at why Zimbabwe has embarked on this path. It is not by accident that ZEC has embarked on the Biometrics project. The history of disputed elections and unclean/suspicious voter registers is a known political burden to Zimbabwe. This has damaged the credibility of Zimbabwe elections leading to violence, leading to loss of lives, people being displaced and some fleeing the country. The cost in terms of human lives and the country’s economy has been monumental and cannot be quantified. It is clear that the current scenario cannot be sustained, and an improvement/change in the electoral process is crucial. Reverting to the use of national IDs or licences will create the same cycle of rigging accusations and discrediting of the electoral process – a vicious circle which needs to be avoided. In 2012, ZEC said they would need about US$20 million to spruce up the widely-condemned roll after which constituency boundaries would be drawn up for general elections(The Herald 21/12/12). It is on record that a proposal for biometrics registration was made at that time, detailing that the exercise could be carried out within 3 months, costing USD20 Million; the same figure that ZEC had said it needed to clean up the voters’ roll! The current proposal for BVR is based on a budget of US$29 million; to produce a NEW clean and credible voters’ roll – surely not an expensive exercise especially if put into context of what it will achieve. The cost of acquiring the equipment needed is no more than US$15 million. Therefore the “unaffordability” claim is unfounded. Furthermore UNDP had offered to fund the BVR procurement process through their structures to ensure transparency, a proposal which has now been rejected for ‘sovereignty’ reasons. However the government has now made US$17 million available to fund the process. In addition, this process is sustainable, and will be much cheaper in the next elections (no/low procurement cost) in addition to the bonus of sustainable dispute free elections. Having said all that, BVR in itself does not guarantee successful, fair or credible elections. 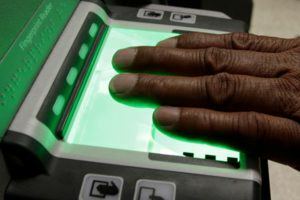 The author does not propose the use of biometrics as a “silver bullet” capable overcoming all obstacles Zimbabwe faces in ensuring a level playing field in which all eligible voices have their say in the political future of the country. Its effectiveness can only be recognised if applied in tandem with the political-will and sincerity of authorities in charge, who are tasked with guaranteeing fairness and ensuring inclusion of all citizens. Biometric technology cannot solve problems rooted in issues such as mistrust among stakeholders or lack of political freedoms. Elections, at the end of the day, are a political process. In spite of all the challenges, the introduction of biometrics in the compilation of voter registers should improve the accuracy of the voter registers and provide the foundation for clean and violence free elections. Ghana has used biometric registration and verification in three consecutive elections (the latest occasion being in 2016) proving that the process can be reliable and sustainable. It is therefore urged that ZEC and all stakeholders embrace biometrics technology to ensure integrity, inclusiveness, accuracy, transparency and accessibility in the coming elections. The media should act responsibly and report facts accurately, and ZEC should take a pro-active role in explaining the BVR process and educating the public. 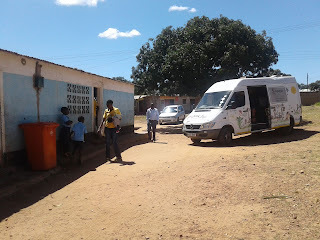 Zambia has started decentralising psychiatry services in a bid to offer mental health services to a segment of the society which suffers stigma and discrimination. 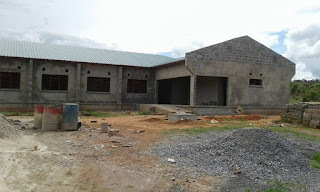 At present, the country only has one psychiatry hospital in Lusaka: Chainama Hills Hospital. With the increase in population and the increase in the number of people with mental problems, the need for these health services keeps growing. This is why the Zambian government has decided to build mental hospitals in all the 10 provinces of the country. The first of such hospitals is being built in Ndola on the Copperbelt. The structure, which is being built at the cost of K14 million is almost complete, only roofing, painting and plumbing are remaining. The Ndola Psychiatry Hospital will have a bed capacity of 154. The health facility is expected to open its doors to the public in July this year. “This Psychiatry hospital will offer arrange of health services from mental health to offering refuge for drug addicts, alcoholics and rehabilitation for youths. 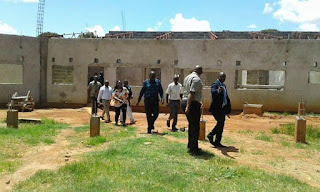 Government wants to bring mental health services closer to people,” said Zambia’s Health Minister Dr. Chitalu Chilufya when he recently toured the construction site. And Copperbelt Province Senior Works Supervisor Steven Makunku, who is supervising the whole project, says the facility will have several rooms for various purposes. “This hospital will have consultation rooms, a laundry room and facilities for rehabilitation. The good part I that the contractor Jearmy Enterprises is on schedule and will hand over the facility in July,” said Mr Makunku. The Ministry of Health has already deployed over 20 health workers to man the facility once its completed. 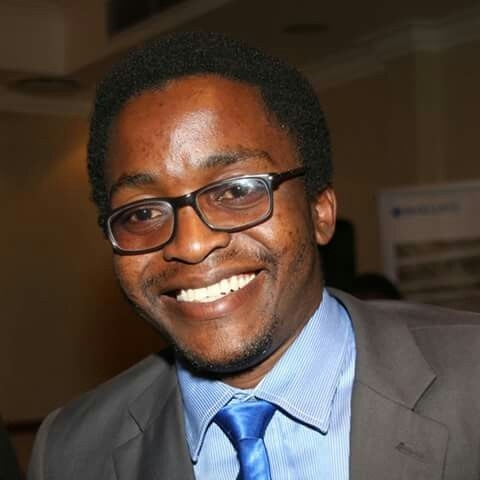 The team is led by Dr. Venevivi Banda, a Psychiatry specialist. In Zambia, having a mental condition is so embarrassing that some family members are abandoned for fear of being ashamed. This has led to many mental patients rooming the streets due to stigma. For those who take care of them, mental patients are tied to trees or locked up in the houses to ensure they do not roam around. But to those who are taken to the Chainama Hills Hospital for psychiatry treatment, the tag of ‘madness’ usually hangs on them. This is why this move to decentralise mental health services across the country is being welcomed by mental health activists. “As President of the Mental Health Advocacy and Support Initiative (MHASI), I am very delighted to learn of the development of mental healthcare facilities in Ndola. This current government has done exceptionally well in the area of promoting mental healthcare,” said Dominic Chatewa, a Lusaka-based mental health advocate. Mr Chatewa, who himself was once treated at Chainama Hills Hospital, however says building psychiatry hospitals is not enough without a legal framework. “As MHASI, we are still calling on the legislature to expedite the enactment of the 2021 Mental Health Bill which would replace the current archaic 1951 bill. The bill will set in motion a number of policy issues that will be of benefit to society,” he added. The issue of mental health in Zambia is so sensitive that MHASI is among a handful of non-governmental organisations who openly advocate for the well being of mental patients. People would not want to be associated with mental patients for fear of being labelled as a mental patients themselves. Hers, is a life lived against the odds. With almost everything seeming to be against her, Cynthia Sichula has triumphed over her ills. For years, she lived an ordinary and relatively healthy life of a teacher. But little did she know, that she had a serious affliction. She was struck with gangrene. At its worst a body part begins to rot and amputation is inevitable. In April 2009, Cynthia’s gangrene had wasted both her legs at the knee and doctors had no option but to amputate. "I got gangrene, i didn't know that disease. I was just told by the doctor, he explained to me. Both of my legs started drying up, i stopped feeling pain. Doctors decided to remove both legs so that in future i may wear those plastic limbs. I actually got sick on 31st December 2008 as we were going into 2009 and four months later i was amputated," said Cynthia.And so ended her life as a teacher. 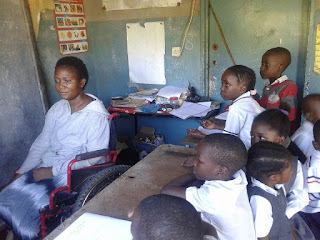 Confined to a wheel chair, Cynthia had difficulties in getting a job as a teacher. To make matters worse, her husband also lost his job at Luanshya Copper Mines when the company was placed under maintenance and care. 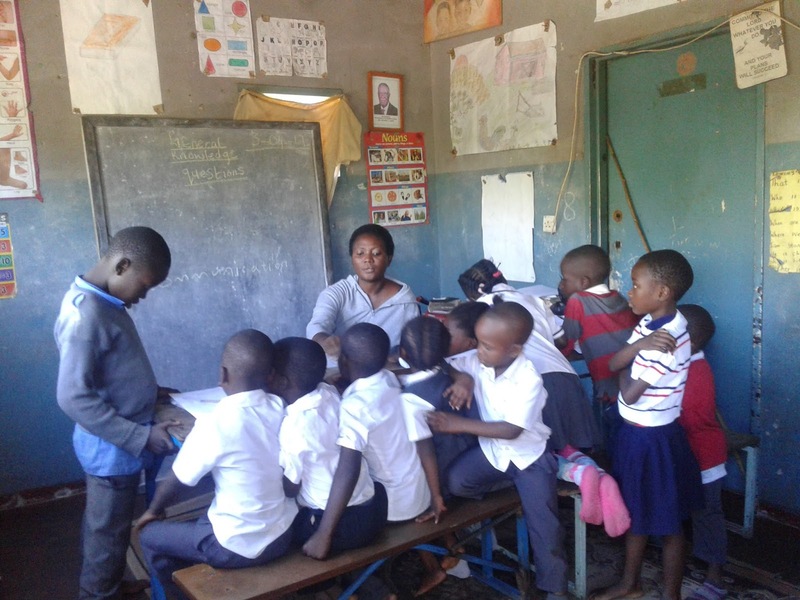 With both of them out of employment, Cynthia decided to form Zyuka Nursery and Primary School inside her two bedroom house in Luanshya’s Section 25 area. "I just decided to open a school here in my living room. 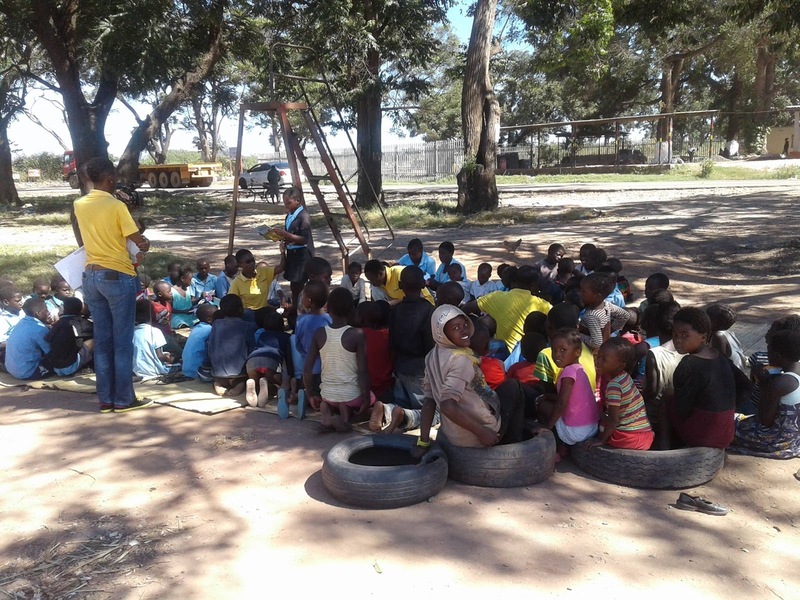 The school is three years old now and i have pupils from nursery to Grade four." For the past three years that the school has been in operation, a number of pupils have passed through her hands and gone on to continue with higher education. "I have taught many pupils at this school, some are even in upper schools. Even these who are here are very sharp. Very soon they will go to higher schools like Nkambo Primary School because here i don't have Grade five," she said. Her condition does not make it easy for her to teach as she is confined to here wheel chair and movements restricted. One of her challenges is writing on the board. "As for the Grades ones and the babies, someone has to move around and check what they are doing and how they are responding to the lessons. And the space here is too small, i cant move with my wheelchair to check them." Her son, who is one of her pupils, helps out, though his assistance is limited. 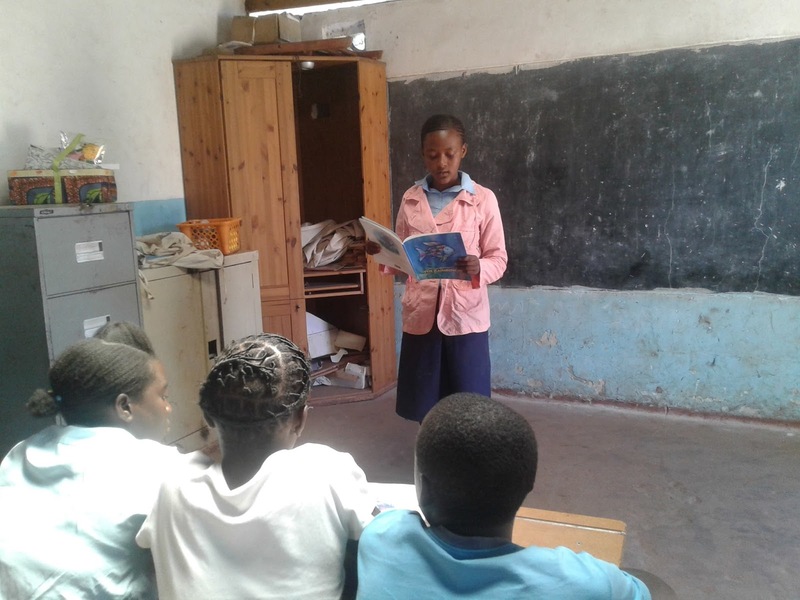 "I'm appealing to the First Lady Mrs Esther Lungu to help me with the building of the school, as you can see the classroom is too small. I only have two desks and a board," said Cynthia. But her teaching has NOT been in vain. Her pupils are sharp and very alive to current affairs. 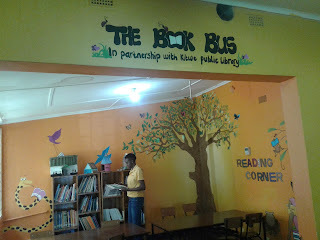 When this blogger visited the school, he heard them recite the name of the President, names of all previous Presidents, Zambia's first female Vice President and the country's youngest ever diplomat Vernon Mwaanga. 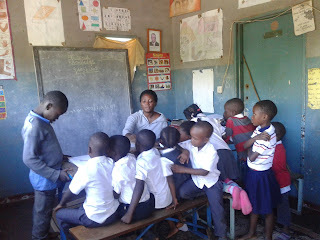 The young boys and girls enjoy being taught by their sole teacher. 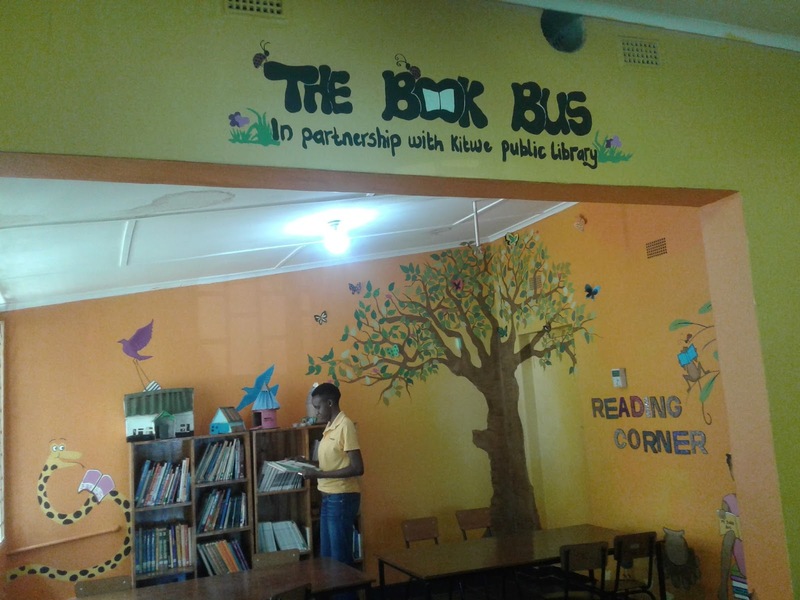 "She teaches very well and she is sharp," said one of the female Grade Two pupils. And her neighbours marvel at her endurance. "Children from this school are doing very well and the owner is making an impact in our neighbourhood. The lady needs alot of help from wellwishers," said James Katempa. It is obvious that Cynthia is one of those rare souls, who remain undaunted and keep going even when it is darkest. EDITOR'S NOTE: This story was originally aired on TV1's Morning Live program on 6th April 2017 and it can be watched here.